'1968 and all that' is a temporary exhibition at the National Railway Museum and because Vera is a 1968/69 model she is going to the spend a week at the museum as part of their display of other forms of transport from the era - remember she was designed to hold two adults and two children comfortably so could be seen to signal a challenge to rail travel for the family market. 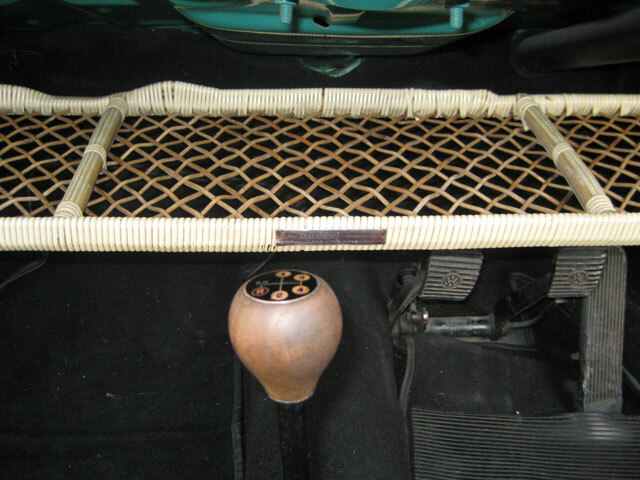 I finally got the Bambus parcel shelf fitted with a few self-tapper screws, a spirit level and some careful balancing! It looks okay and should actually be useful too. The shelf will hold the 1968 brochures that I have so that they can be on show and too. The mounting looks quite tidy and I re-used the brackets that came with the shelf so they may be original. 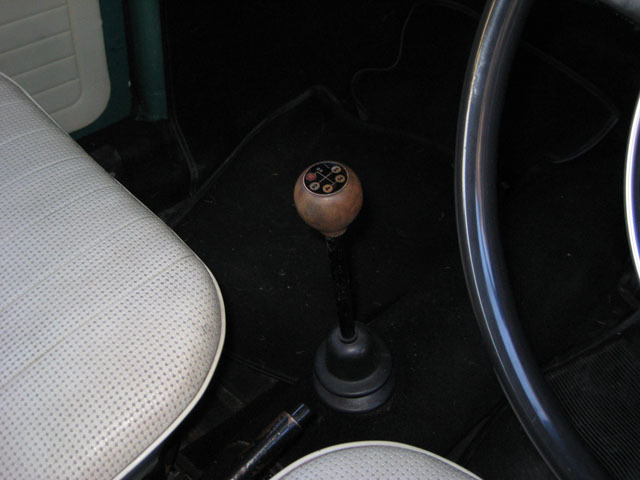 You can see that the shelf is cut-away for the left-hand drive steering column however it is flat on the right so fits quite nicely - I was worried about it have a sticky-out bit that would get in the way of the steering column but it wasn't a problem in the end. Next job is to Waxoil her underneath and drill some holes into the heater channels and get some waxoil in there too - I primed them well before they were fitted but the waxoil won't hurt either. Summer is here and Vera is ready for the show season and her participation in the 1968 exhibition at the National Railway Museum. We spent a lovely weekend at Ryedale Folk Museum in May with our friend Stuart who spent many summers in the village of Hutton-le-Hole as a lad. 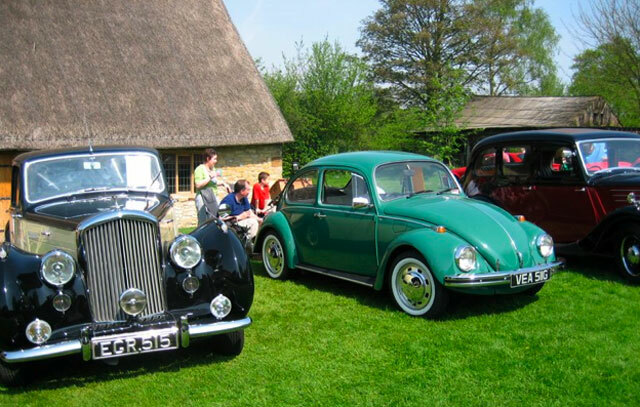 She is seen here next to a nice Bentley that originally came from Sunderland! 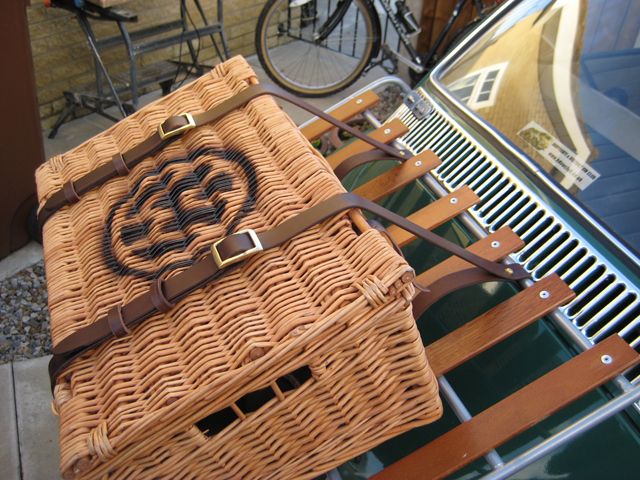 Leather luggage straps finished and fitted today! The straps can be altered so that I can take various size cases but this is the default size. 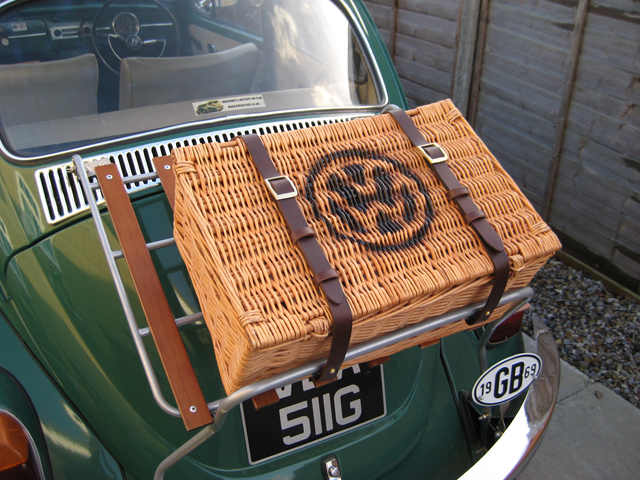 I have been busy making some leather luggage straps to go with the rear deck rack and hamper. I decided to get them made rather than buy some as I had a clear idea of what I wanted and luckily for me there is a good leather shop in Pickering and he was able to knock these up for me and after a quick visit to a hardware shop for some brass nuts and bolts and a little bit of fiddling I'm quite pleased with the results. 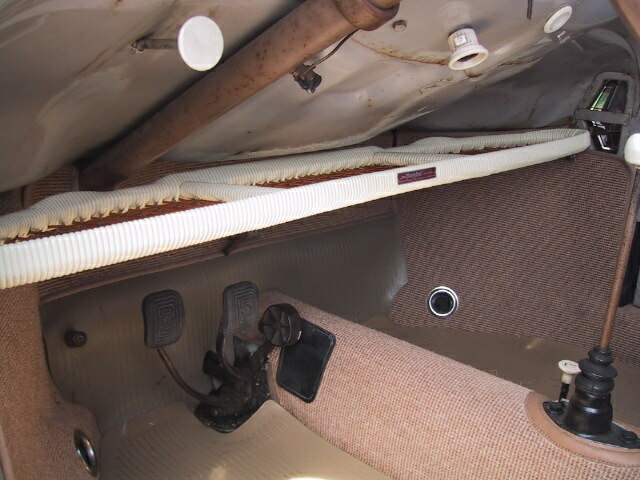 The other jobs that I have been putting off doing but finally got round to was fitting the rear carpet in the back - not a great job but better than the peeling off that was happening before. 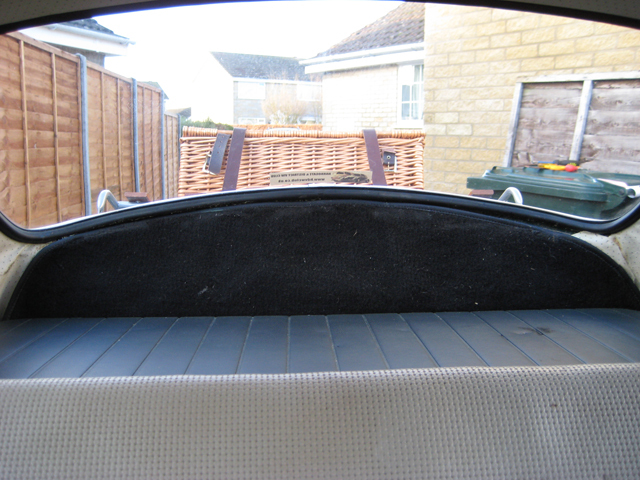 The rear parcel shelf looks okay now too and helps to make it a bit neater in the back. 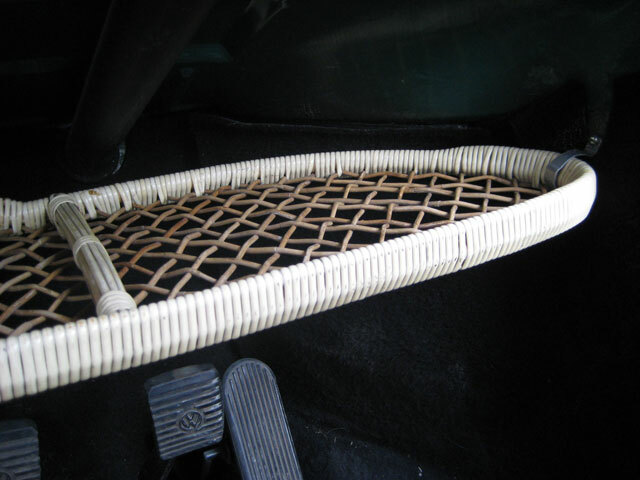 Next job is to fit the Bambus shelf and carpets in the front properly. When the nights are dark, wet and cold the only thing to do is buy gadgets for Vera! and thanks to www.thesamba.com you can get just about anything you need. 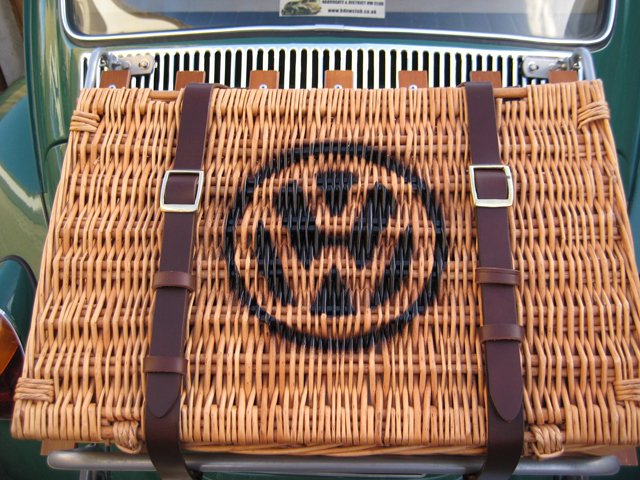 We have also booked a few days in Germany so that we can go to Wolfsburg! 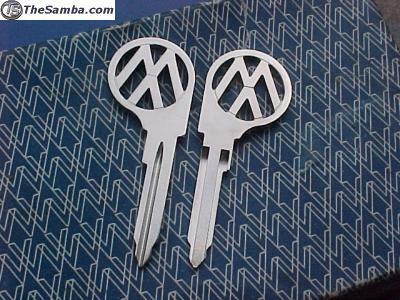 Thanks to the power of the internet I have had some new ignition keys from the VW Key expert Gabriel Garcia in Texas and after a quick visit to the local locksmith shop the new ignition key is ready and working. 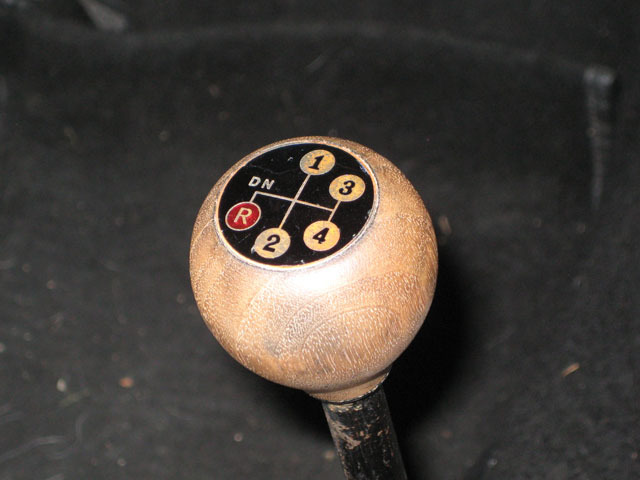 I have ordered a nice little Mr Bubblehead leather key fob to go with this and to match the one in the glovebox. 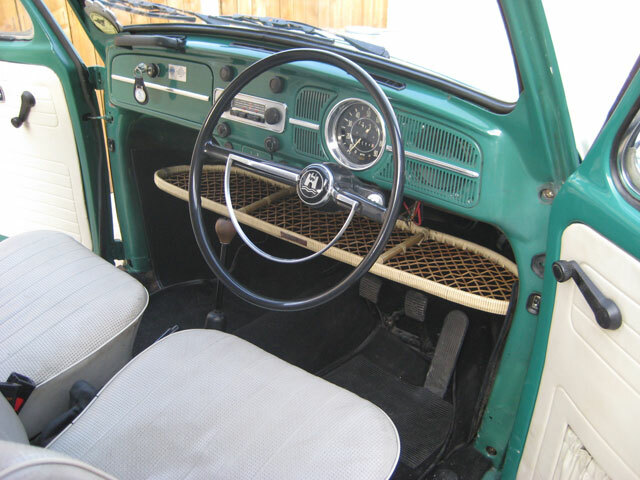 I have also an original Bambus parcel shelf which was bought on ebay (from the UK). 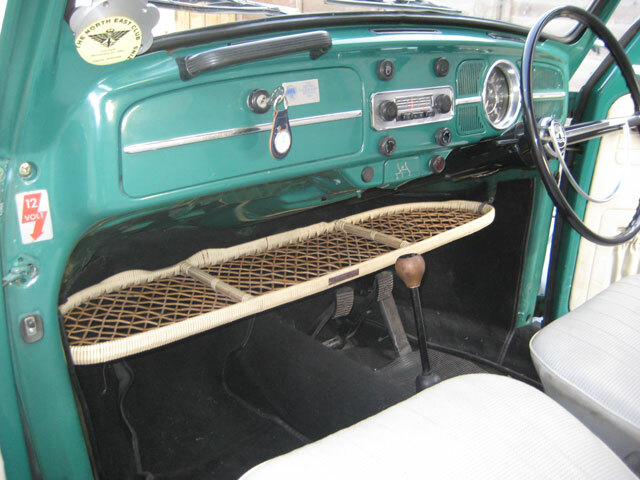 Although this is an earlier model than Vera you get the general idea of how the parcel shelf will fit. After a quick search on the web it would appear that fitting the Bambus sheld seems to be a rather difficult job so we'll see how I tackle it! Now the interesting thing will be figuring out how to get the Atlas whitewall tyre inserts fitted along with the four new tyres (thought I'd get it all done in one go and they are booked in for next week). Once the tyres have been fittted I then need to finish off the boring paint jobs (underseal) and waxoil her so that she stays safe this winter. 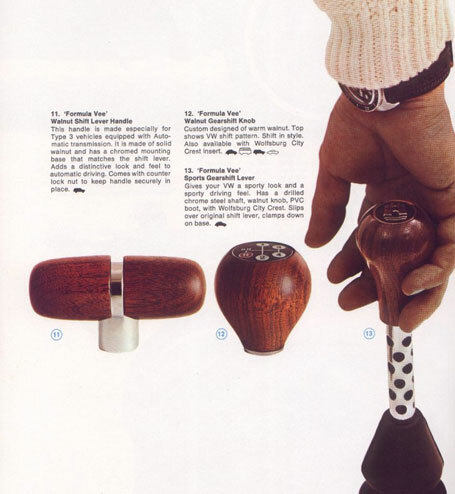 I also stumbled accros a good advert for the Formula Vee Walnut Gearshift Knob which was in the 1970 VW Accessories brochure. It also features in the 1969 brochure so is just right to go with Vera and I have a thing about wooden interior accessories so it is staying with her now. 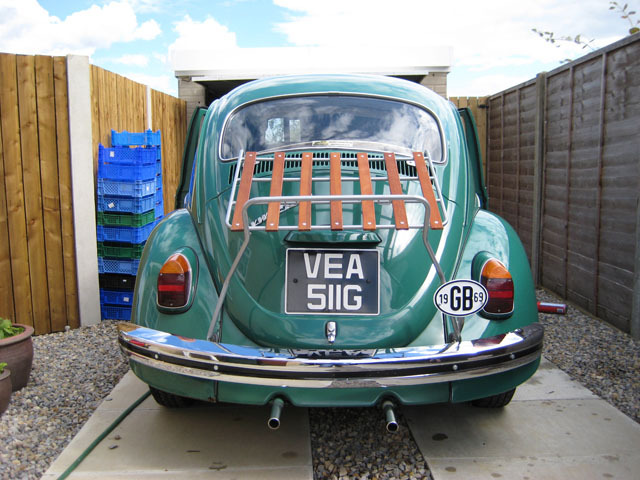 There has not been much progress this month as the weather is turning and until I get Vera fully Waxoiled I don't want to take her out too much. 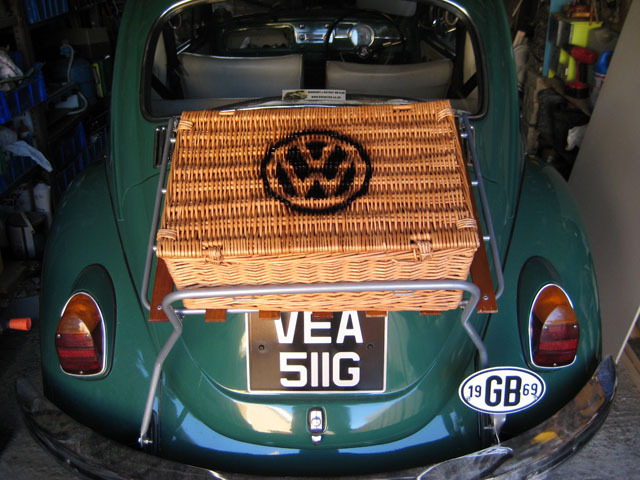 However I have had time to create a VW style hamper which will stay on the rear-rack as anybody who has visited the site before knows that I like the traditional look! 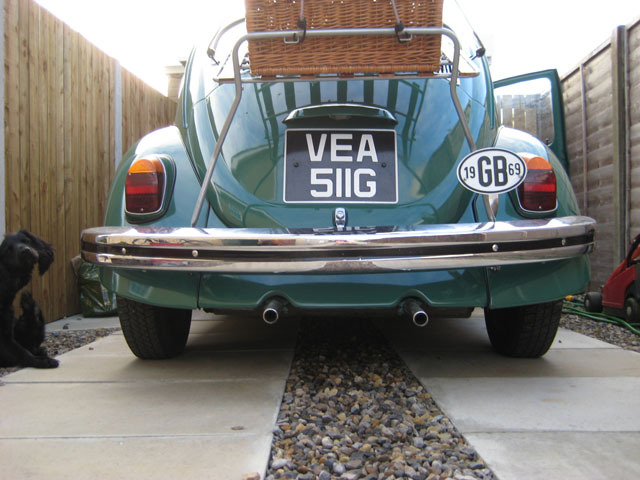 Next dry weekend we have I am going to get the indicators fixed, mudflaps fixed and the whitewall inserts put into place. The saga of the mud flaps continues! 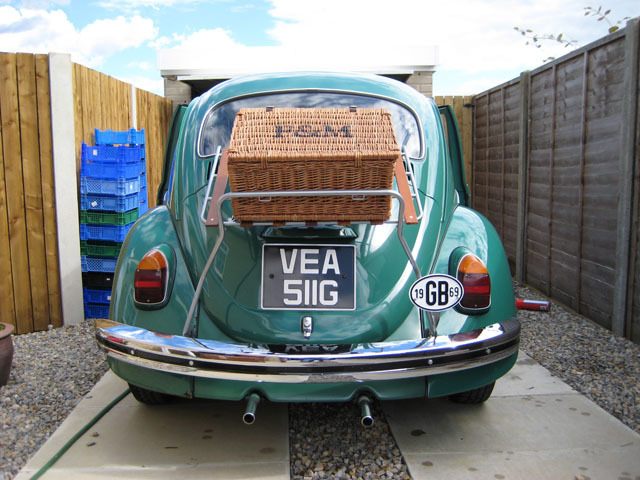 All I want to do is to fit Mr Bubblehead to the car - sounds easy, especially as they came with brackets. 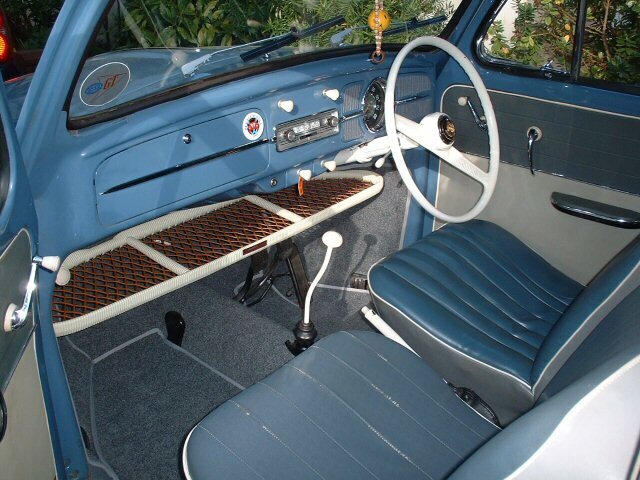 So they should look something like this (obviously not touching the floor, but you get the idea) when fitted. 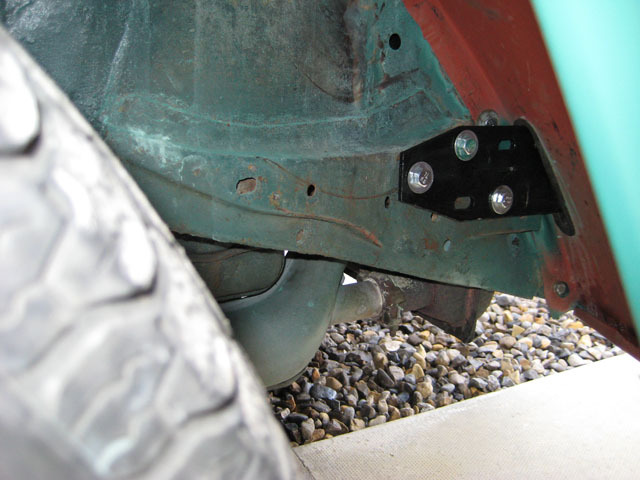 The 1969 bumper brackets look like this. This appears to be the problem, unlike the 1966 bracket that Alex showed me via the Harrogate and District VW Club forum, the bolts are not aligned horizontally and the bend in the body arch follwoing on from the bracket means that a straight 'L' shaped bracket is not going to fit. 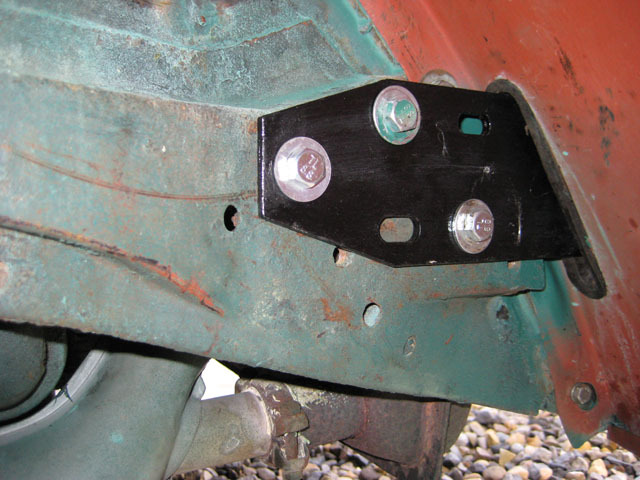 It looks like we will have to make some brackets at I have looked at this for hours trying to figure out hoe to get them mounted and they are just not going to work with the brackets that they were supplied with. 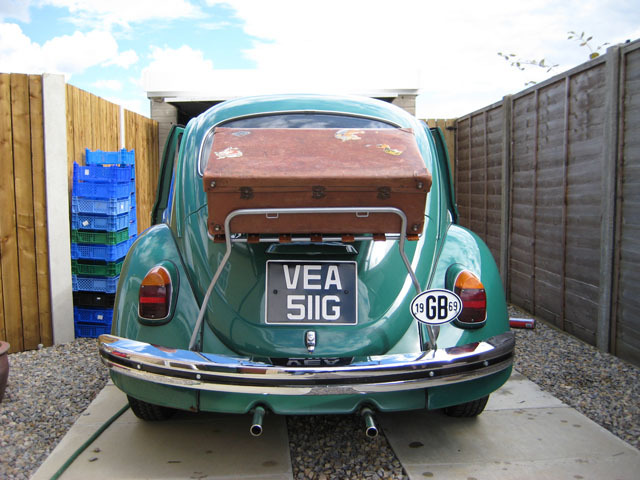 Anyway, here is a before shot of the rear - note how the rusty bumper have been replaced with the shiny new ones now. Zack the puppy makes his first appearance on the site too - Lucy and Cleo the labs stayed at home as they don't fit into the front of Velvet the New Beetle as nicely as he does. 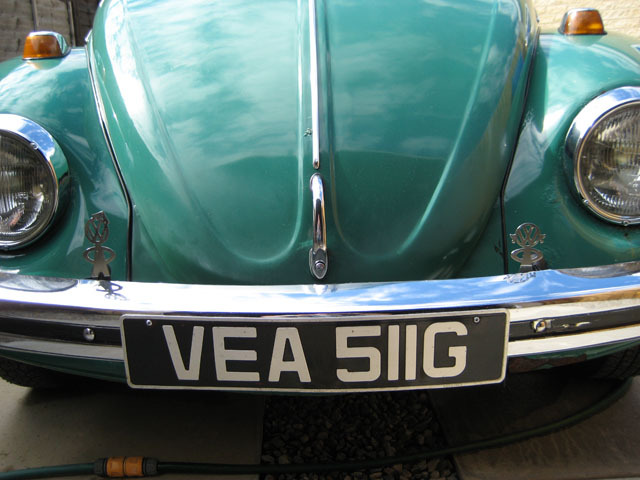 Vera has been painted now - not the best job in the world (very hard to get good quality cellulose thinners nowadays) but it was quick and easy! I have fitted the chrome bonnet grille but it doesn't want to stay on very well so will have to figure out a good way of attaching it to her. Rear decklid chrome fitted too - again not the best fit the the rear rack holds it in place well. Had all kinds of fun getting the bumper lined up to the replacement mounting brackets but it will do the job now. 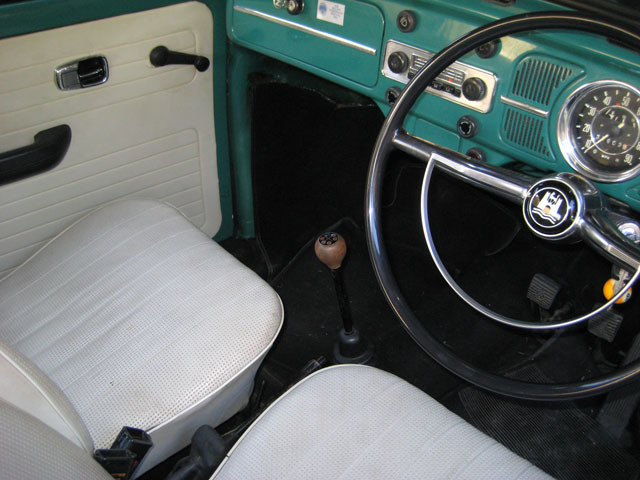 The interior liner could do with being replaced but not at the moment as I seem to be spending far too much money on her at the moment. 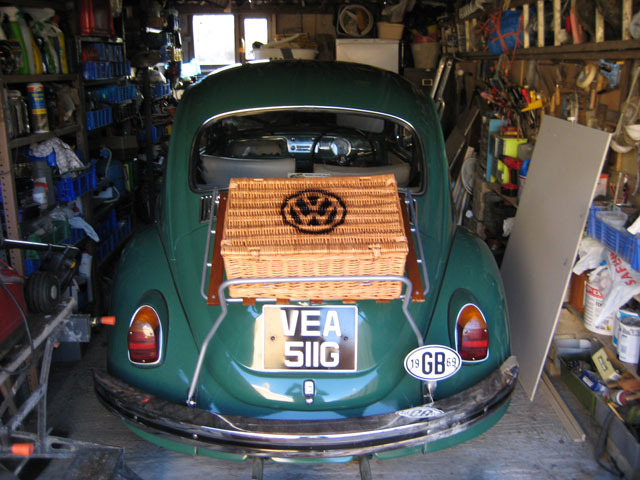 I'm pleased that the toolbox fits into the front though. The door that I bought from Simon (Biscuit) is now fitted and it looks fine. Also the near wings have painted up well. The actual fittings are a bit off - the running board has nowhere to attach to the from wing but I will just have to make a new hole for the bolt at some stage. Front replacement wing looks fine too - again not the best fit but that's what you get with cheaper parts I suppose. Front wing is now totally rust free! and Mrs Bubblehead is fitted into place. The original bonnet stayed on in the end as the one that I got with the car was worse than this one. Just waiting for the engine script badge to arrive and for a flash of inspiration as to how to actually fit the mud flaps as I can't see how they fit at all. Getting ready for a new coat of paint! Vera is at the garage ready to be painted. She is going to have new wings (front and rear) and a better passenger door fitted too. The bonnet that I was going to fit was not in very good condition so we just left the old one on. This is the last time that the horrible rusty wings will be seen - the new ones are not going to be the greatest fit but at least they are new! 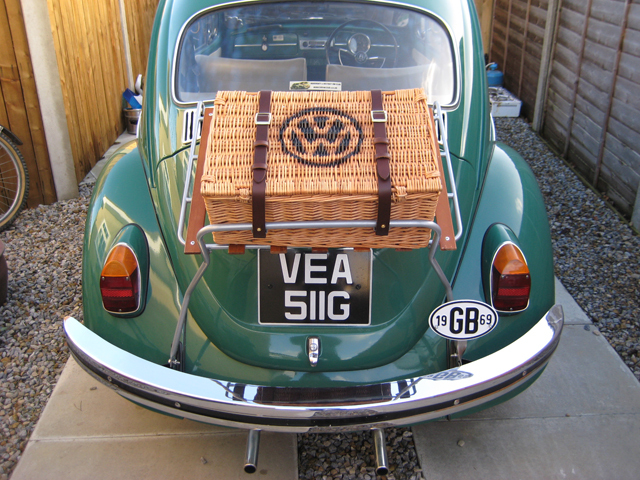 Vera is waiting to be painted now so I am spending a bit of time (and money) on getting the accessories sorted for her. 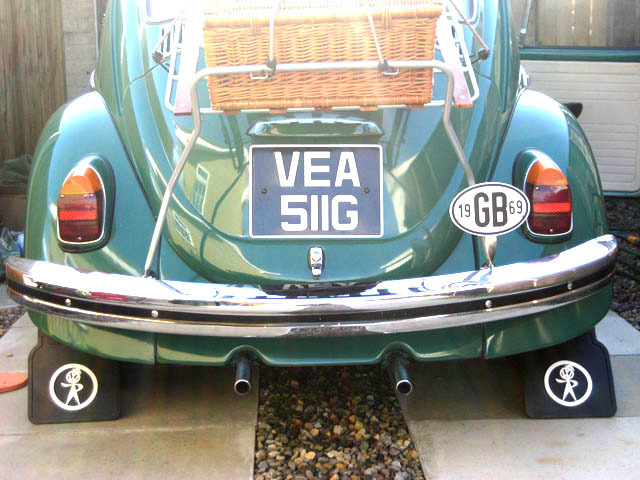 If it is not featured in the 1969 Beetle Accessories Brochure then I am not going to fit it - the only exception will be the Mr and Mrs Bubblehead bumper badges as I really like these and they are simple to remove without damaging anything too much. 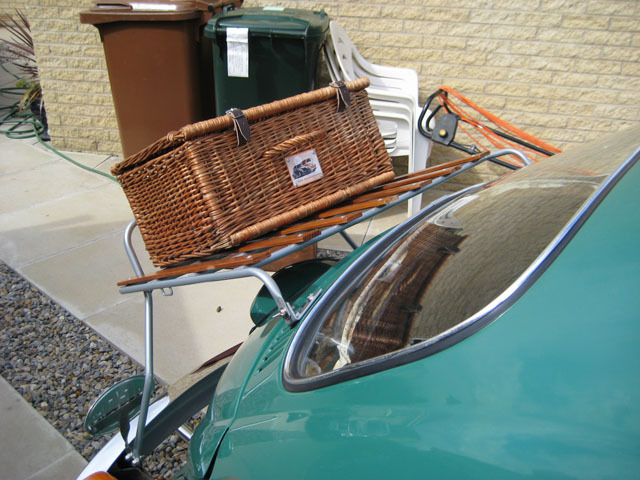 I have been sorting out the luggage rack and seeing which options I prefer on the rack; at the moment the hamper is winning. 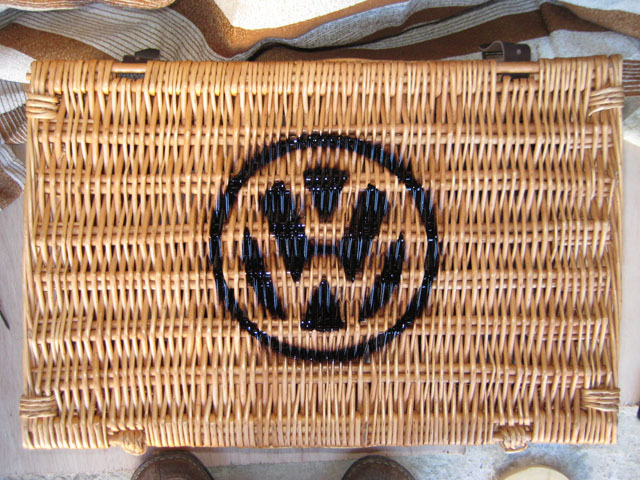 I am have fitted a little VW badge to the hamper and I waiting for a few more badges to arrive from the USA to add a bit of a VW theme to the hamper. The one piece of kit that I really wanted was the original (Empi?) 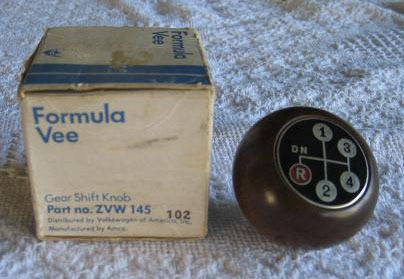 wooden gear stick knob that is featured in the 1969 Brochure - I didn't have much response from the forums but eventually found one in San Diego (via Ebay for about £11.00) so it was fate - and doesn't it look just right after a rub down and wax! Mr and Mrs Bubblehead are now fitted but of course all of the little things will have to removed when she goes in for her quick paint job - no bare-metal resto but it will be better than if I had done it. I touched up the number plate as there were little bits of red paint showing through - a little bit of Hammerite paint sorted that out.